Computer: turn on the computer and use your CEU details to log in. ZOOM H5 digital recorder: pull the button down and hold it a second or so. Once it turns on there is a screen relating to the USB interface. You don’t need it. Please press the menu button on the right hand side of the recorder to exit this screen. 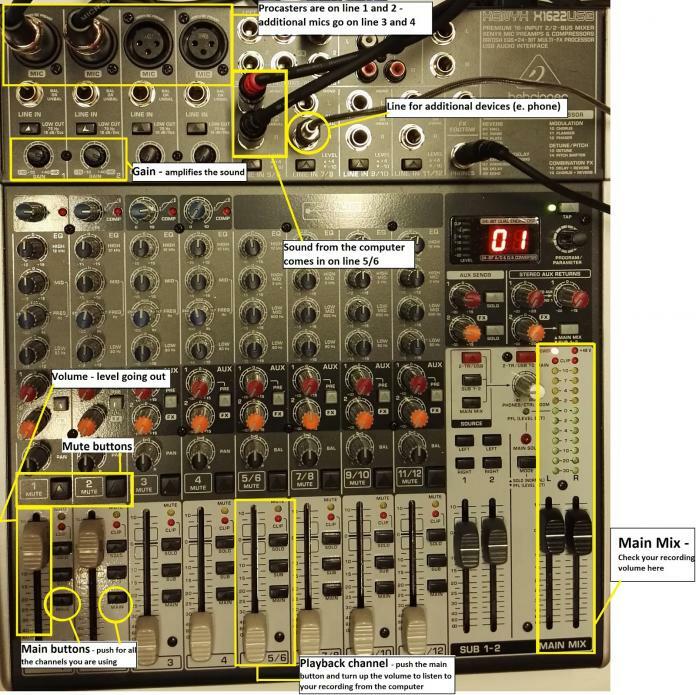 The two Rode Procasters are left permanently plugged into the mixer, on line 1 and 2. Additional mics can be added to channels 3 and 4 with XRL inputs and the remaining channels with 1/4" inputs. Channel 7/8 is reserved for additional sounds/music input. This might be useful if you want to play your guests music or sound effects during the podcast making, otherwise we would recommend adding in music/effects during the editing. 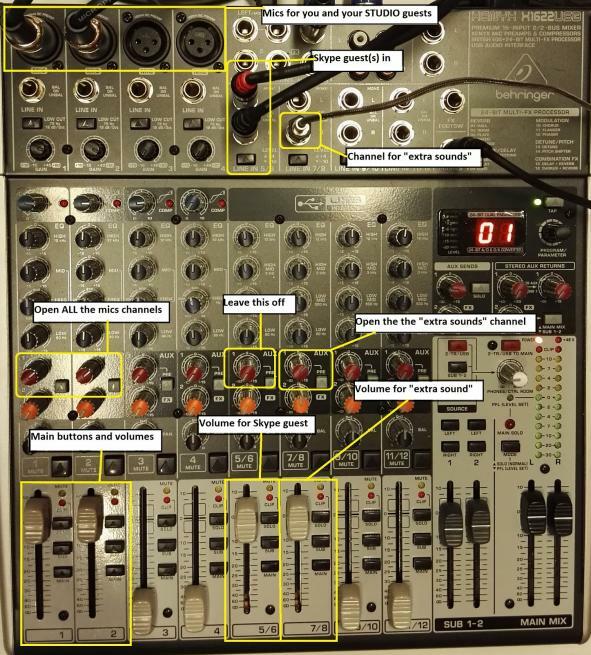 Make sure your mic and your guest(s)’ mics are plugged in, check mic volumes, and make sure the “Main” buttons are pushed on ALL the channels you are using. On channel 5/6 the sound from Skype will come in, so you will be able to hear your guest. If the call is very quiet push the ‘level’ button for a boost. On channel 7/8 you can plug in any device where you have “sounds” stored (phone, laptop etc). You will use this if you want to play music, sounds etc to your guests (including Skype). Adjust the volume accordingly. The AUX 1 controls (dark red buttons) are allowing the sound to go in and out of the mixer, so you can control what your Skype guest hears. You want them to hear you, your studio guests and the “extra sound”, so the AUX controls are opened on channel 1, 2 and 7/8. They are OFF on channel 5/6 because you do not want them to hear themselves. You might want to think of gain as ‘sensibility’. Once a recording has started you will probably not want to change it, whereas you might with volume. We usually leave gain set to about ¾ and we would suggest you leave it there most of the time. Important - if you increase the volume or the gain too much then you will increase the noise floor so much then you will get a horrible hiss on your recording. iii) you can also change the recording volume level on the digital recorder and Audacity. For the digital recorder we usually leave it set just a little below 3. This works well for most voice recordings. Important - we record on both in case one crashes. We think that the digital recorder sounds better than the computer so use that one for editing unless there is an issue. Press the stop button on Audacity and save (not export) the file. Press the stop button on the digital recorder (it is saved automatically). To listen back to the recording from the computer either input the computer sound by putting channel 5/6 into the main mix (press the Main button) or plug the headphones into the computer. Make sure you plug the cable that was already there back in once you’re finished. Export the Audio from Audacity as a wav file (check our guide if you don’t know how to do this). Press Menu on the right side of the recorder, scroll down to USB and select this, then choose the option ‘SD card reader’. The device will then appear on the computer as an SD card called ‘H5’. Open it and go to Stereo : Folder 1. Your file is there, copy it as you would any other file. Position the mics by moving the stands (don’t touch the mics). The stands can swing and also be bent up and down. If you are using the Rode Procasters, the sound is best if you get in really tight to the mic (no further away that 5 cm).